Why do you need a Pool Safety Fence, Net or Pool Cover in Tampa Bay? Florida ranks #1 in drowning for children under 4, and 80% occur in unsecured home pools! Pool Safety Fences in Tampa save lives! And when it comes to Swimming Pool Safety Fences, Covers and Pool Nets- Experience Matters, and Pool Guard has it! Pool Guard of Tampa Bay has installed thousands of Pool Fences, Pool Safety Gates, Pool Covers. and Pool Safety Nets in the Tampa Bay area for over a decade so you can feel confident we can protect your pool too. We have won numerous awards for customer service and business ethics and are rated on BBB a Perfect A+ ! We offer the highest-quality, American made, Pool Guard Brand Removable Pool Safety Fencing , backed by a Limited Lifetime Warranty. Let our trained professionals provide you with the peace of mind of a quality Pool Fence, Pool Cover or Pool Net installation done right the first time. 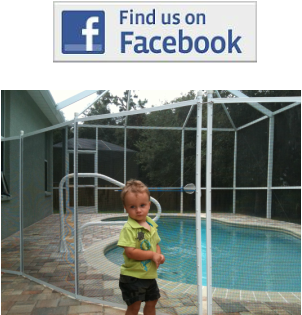 What Makes Pool Guard brand Pool Safety Fencing, and Pool Guard of Tampa Bay so special? your child's life depends on our products! You can buy a cheaper pool fence in Tampa but you can't buy a safer one, period! 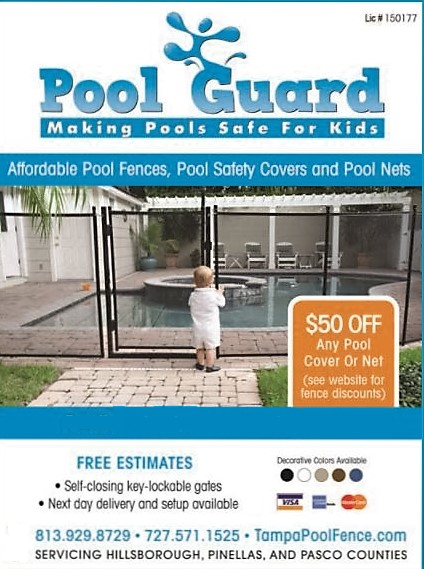 Some companies focus on making a discounted, ultra low priced "Premium" product only to send out a less then professional installer, with, well, an ultra cheap Pool Safety Fence to install....Like everything else, you get what you pay for. You can count on Pool Guard, we are Tampa's oldest and largest Pool Fence company. We are trusted by several thousand local and national customers for over 20 years. We offer the highest quality Pool Guard brand Pool fencing which is Manufactured locally and backed with a Limited lifetime manufacturer warranty. Our Pool Safety Fence is highly rated and A.S.T.M certified to meet the strict Florida Barrier code requirements. It is made with the strongest available Quad Core aluminum Safety Fence Poles and our Mesh fencing is UV Protected, strong and Ultra transparent. All of our installation hardware is stainless steel so you can be sure our Pool Fence will not rust or corrode! Beyond our great products (Pool Safety Fencing, Pool Gates, Pool Safety Covers and Pool Nets) are our people. We have been providing Pool Safety Products in Tampa Bay for many years and our reputation for quality and service is exceptional! Don't take our word for it, check us out online, ask your neighbor or call a local swimming pool contractor for a referral. We are Licensed #150177 and Insured. We look forward to helping you with your Pool Safety Needs! What time of the year is best to have a Pool Safety Fence installed in Tampa? One of the biggest misconceptions regarding a pool safety fence (in Tampa) is that homeowners need it only during the summer months when they're using the pool on a regular basis and children are spending large amounts of time out at the swimming pool. The unfortunate reality is that a drowning can happen at any time of the year. In fact, statistics show that most accidents do not happen when the family is outside using the pool, but rather when a door leading to the swimming pool is accidentally left open or when a small child opens the door and walks outside. That scenario is most likely to result in a tragic accident. What further adds to the likelihood of an accident happening is the fact that during the cooler months of the year the windows and doors are MORE likely to be open than during the very hot summer months. When summer ends and fall begins and when winter ends and spring begins people like to open their doors and windows and this is when a tragic accident is likely to occur. can be prevented by installing a pool fence and making sure it is in place 24 hours a day, 365 days a year. Pool Guard of Tampa offers year round Pool Fence, Pool Gate and Pool Net installation. We also provide free estimates and next day installation throughout Tampa Bay. Cities such as but not limited to: Lutz - Land O Lakes - Odessa - Largo - Westchase - Seminole - Dunedin - Brandon - Lithia - Wesley Chapel - Palm Harbor and Oldsmar. Mention this add and save $50 off a Pool Cover or Pool Net.